Boots Riley battles class injustice in his impressive and trippy debut film 'Sorry to Bother You' – AiPT! If you’re on the lookout for something a bit more challenging or off the radar, ‘Sorry to Bother You’ may be just the thing. If you’ve caught up with all the current summer blockbusters and are now on the lookout for something a bit more challenging or off the radar, Sorry to Bother You may be just the thing. Written and directed by Boots Riley, songwriter for left-wing hip-hop group The Coup, Sorry to Bother You is not a film for everybody. It’s a super weird, Charlie Kaufman-esque, genre-bending film that the less you know about going in, the better. Tonally, the picture is a bit reminiscent of the recent Netflix hit Okja,, though its politics are less all over the place than that movie and Riley’s film lacks the more problematic issues I had with Okja’s confused science messaging. Sorry to Bother You benefits from a more focused political message, grounded in themes of race and class. 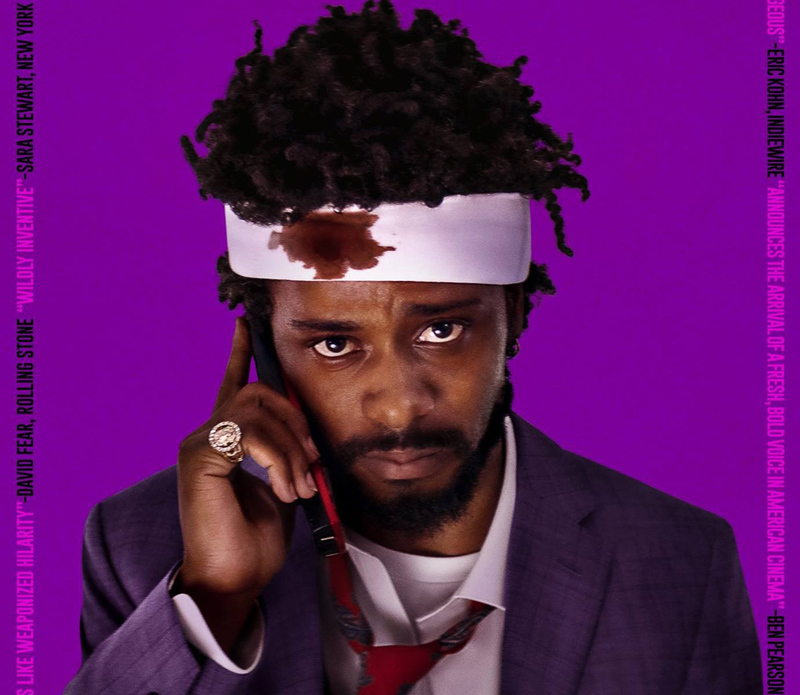 Lakeith Stanfield plays Cassius Green, a low-wage telemarketer working in an almost dystopian basement office, not unlike something out of Terry Gilliam’s Brazil, who suddenly finds professional success by trading in his real voice for one that sounds “white” to conceal his black identity to those he calls. His girlfriend played by Tessa Thompson (Thor: Ragnorok, Westworld) begins detecting a problem when he starts bringing his “white voice” home with him. Meanwhile, a co-worker played by Steven Yeun (The Walking Dead) tries to organize a strike among their fellow telemarketers. To go much further describing the plot would give away too much because the story proceeds down bizarre and totally unexpected directions often incorporating formalist devices that question the viewers’ sense of what is real. One such ingenius reoccurring element has Cassius’ telemarketing calls interrupting the lives of his potential customers in quite a literal sense. As Cassius rises up the ladder at his company, he’s confronted by increasingly difficult ethical choices regarding what it is he’s being asked to sell, including a deeply questionable proposition from a character played with scene-chewing delight by Armie Hammer. Imagine Don Draper on meth. But this is more than your typical story about someone deciding whether or not to sell out. Sorry to Bother You is a frontal assault on the capitalist systems controlling the lives of the 99%. It’s a provocation both to the corporate machine itself as well as to artists and activists who directly fight the machine but fail to see their own blind spots or limitations. Stanfield appeared in another recent genre film, last year’s surprise hit Get Out, as the guy who famously delivers the title line. While it may not be as tightly constructed as Get Out, both are recent examples of sophisticated and subversive genre films tackling uncomfortable race issues in their own distinct ways. Like Get Out, perhaps my biggest criticism of Sorry to Bother You is its final moments. In Get Out, I felt Jordan Peele settled for the safer, more commercially palatable ending over a bleaker, though possibly more honest one. Here, I wished Boots Riley had ended maybe three minutes earlier with a beautifully staged shot — one I thought was to be the film’s final — involving a kind of voyeuristic view of chaotic events unfolding outside. Instead, the film ends with more of a jokey gotcha moment followed by a post-credit stinger that didn’t feel nearly as powerful. What’s particularly refreshing about Riley’s sharp satire is how it champions collective action above the classic American trope of rugged individualism as a solution to class struggle while deftly illustrating how exploitation of the labor force drives oppression. It’s a message that resonates particularly well in the wake of the recent teacher strikes in West Virginia, Arizona, Kentucky, and Colorado. Here comes a rare film that calls out the everyday indignity of underemployment and wage labor while celebrating union organizing. This is Boots Riley sounding the call for revolution. A strong debut from Writer/Director Boots Riley that takes the viewer on a strange, surrealist journey to the top of the corporate ladder.